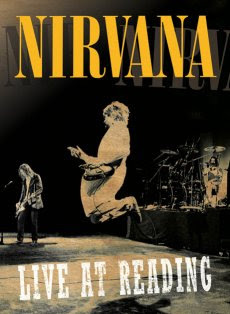 Last week I went along to a sneak peak screening of the 'Nirvana Live At Reading' DVD which is due to be released by Universal at the beginning of next month. I've written a review of the DVD for the Rockfeedback website here. "In 1992, the widespread success of Nirvana's second album Nevermind propelled them to headline status at the Reading Festival, quite a leap from the year before when they sat mid bill and relatively unknown..."
In 1992 I was back in school and having loads of wild parties. Funny enough I'm having a reunion with the same guys this evening, so thanks for the memory. Great review! That's really cool you wrote for another website, keep it up! Thanks Ian, plenty to write about for this site as well but struggling to get it done right now! Moving house is pretty stressful.